Pourover is a pretty hefty topic, so check out our step-by-step guide here, and read on for some tips & insights. If you’re keen on some hands-on training, just contact us! 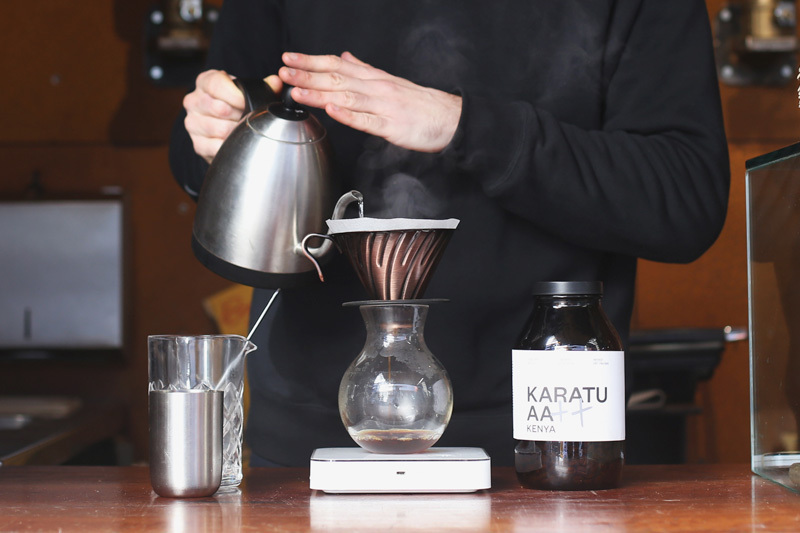 Making a V60 can be as easy or as hard as you’d like to make it. The key is repeatability! You can play around with variables as much as you like, but if you haven’t got the basics down you’ve got no chance of hitting the bullseye time and time again. 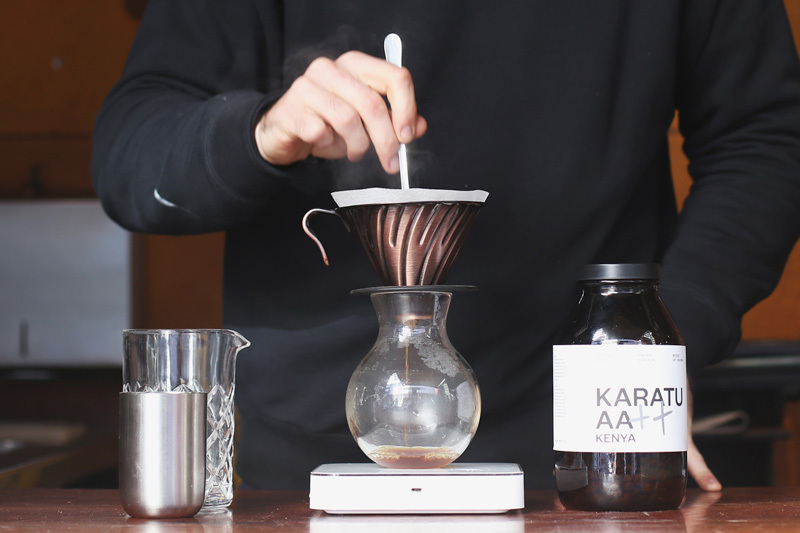 Firstly, the main thing you’re playing with is the particle size of your coffee. This is going to have the most direct influence on flavour and extraction throughout the brew. 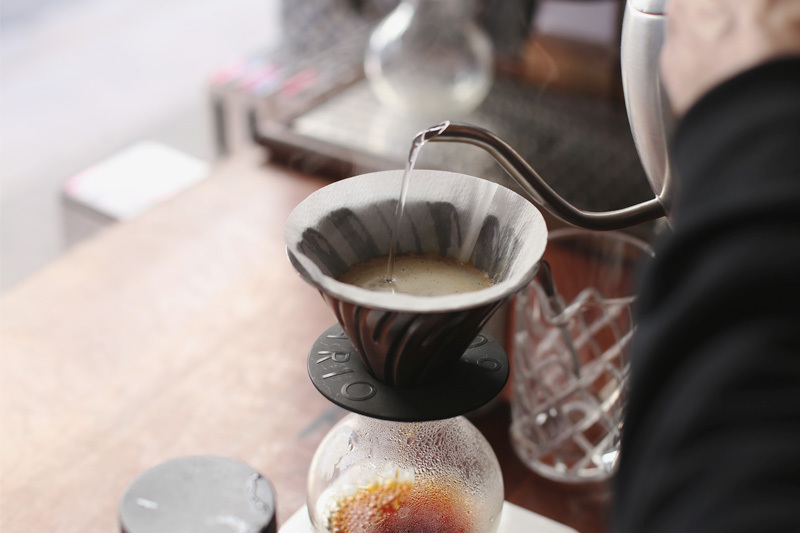 The same principles apply both to espresso and filter – think you’ve under extracted a bit? Increase solubility by grinding finer. Think you’ve over extracted a bit? Grind coarser! Like espresso, different coffees will grind and extract differently, so you’re going to need to play with particle size first to trouble shoot your brew. Secondly, know your recipe! What’s your coffee to water ratio? How long do you want to bloom for? When do you want to finish pouring? When will the entire brew process finish? So many questions!?!?! All of which will change the strength, extraction and flavour of the coffee. We generally keep our ratio pretty close to the 60g/Litre standard, dosing 15g of coffee, then rocking a 50g/30sec bloom with a slow 200g pour finishing around 1:00. A slower or stepped pour (say, 30 sec bloom, 100g to 1:10, then another 100g) increases contact time with the coffee and generally increases your extraction. Faster pours can do the opposite. Changing the speed of your pour can also do amazing things to the acidity and balance of the coffee – particularly if you’re getting really nerdy and compensating for a faster pour with a finer particle size. Agitate in your initial bloom stage. Most recipes will start with a small amount of water (often 50g) which sits for 30 seconds. 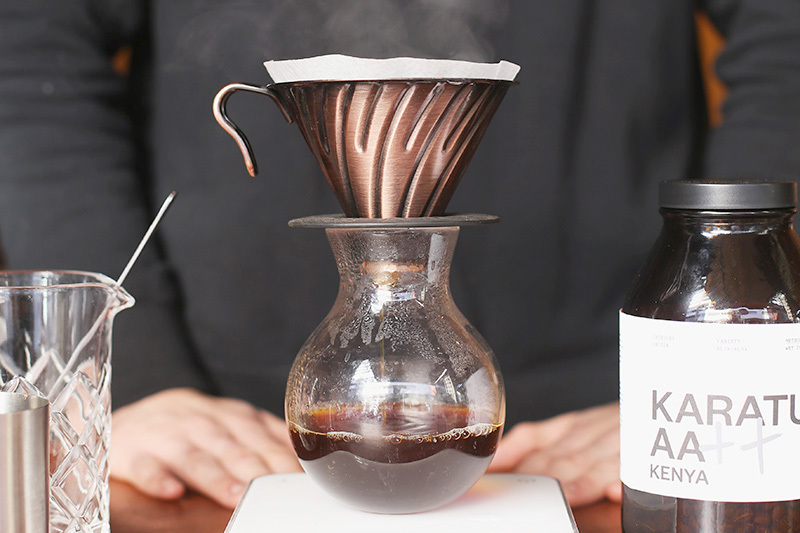 The moment you add water to coffee, extraction will kick off, and we want it to be happening as evenly as possible. Your bloom is designed to saturate your coffee grounds as evenly and as fully as you can, making sure the water can get in there to pull all the tasty flavours out. The easiest way to do this is a big old stir with a wooden paddle or a spoon. Pour evenly. This may seem obvious … because it is! One of the best investments you can make is a gooseneck kettle which will allow you to be much, much more accurate with your pour, keeping that coffee bed nice and flat as well as controlling flow rate into the filter cone. Control, consistency, deliciousness. Perfect. Give it a spin. During the brew it’s a good idea to create a small whirlpool effect by pushing the water around the V60 in a circular motion. On top of this, when you’ve finished your last pour, give it a little push with your spoon/paddle in the same direction you were pouring to keep that whirlpool going. You’ll be amazed at your flat bed of coffee when it’s finished. Flat bed = Even = Good. Lastly, a note on workflow: as soon as an order comes in, put your water on – kettles are slow & they’ll stitch you up! Then, weigh & grind your coffee, rinse your filter (chucking that water out straight away so it doesn’t end up part of your brew) & by the time you’ve done all that your kettle should be ready so you’re good to go.